via LAN, WLAN or serial interface. With OilQsens the condition of the oil is measured with accuracy that is only found in laboratory instruments. 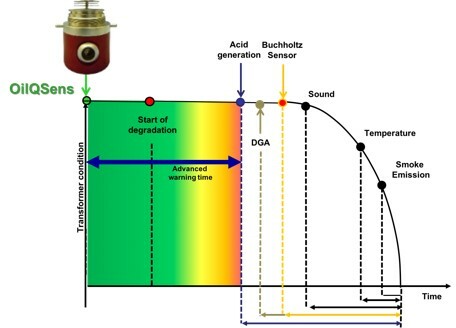 The critical conditions in the oil are temperature dependent, i.e they vary as the temperature increases or decreases. This makes accurate sensing and measurement difficult if not possible, until now. 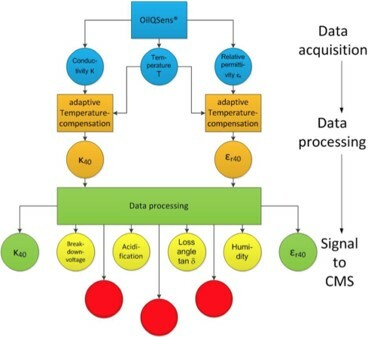 OilQSens features a unique self adapting temperature compensation algorithm similar to a neural network. This make it possible to provide very high levels of accuracy with speed of detection. 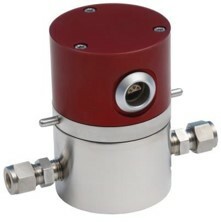 The OilQsens sensor system consists of the sensor and a communication module. In the communication module, there is a web server with an HTML page for presentation of the data. The data is also available via the web-based monitoring system. Traditional methods of Condition Monitoring only begin to work after damage has started. In truth these are Damage Monitoring rather the condition monitoring systems. The best that can be hoped for is that enough warning is given to prevent an unplanned outage, but often even this is not achieved, OilQSens changes that. OilQSens starts monitoring the critical parameters from day 1. This permits true Condition Based maintenance to be implemented with all the cost saving benefits this brings. Earlier intervention = lower cost. OilQSens reduces downtime and increases asset life of transformers by providing truly meaningful continuous monitoring of oil conditions remotely and providing warning to operators by any variety of methods. 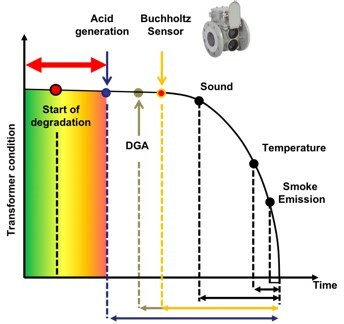 The diagram above shows the data acquisition and processing model followed by OilQSens. This allows for the application of Condition Based Maintenance and a huge saving cost over traditional methods. 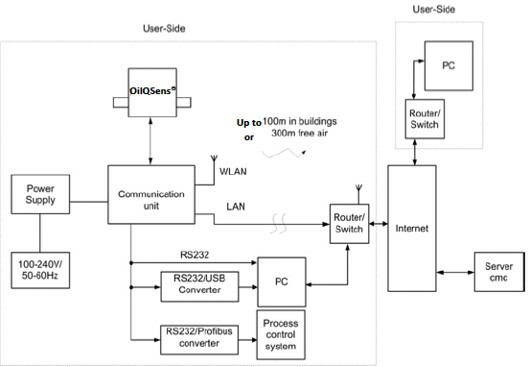 OilQSens has multiple communication options available making it possible to integrate with existing SCADA etc. 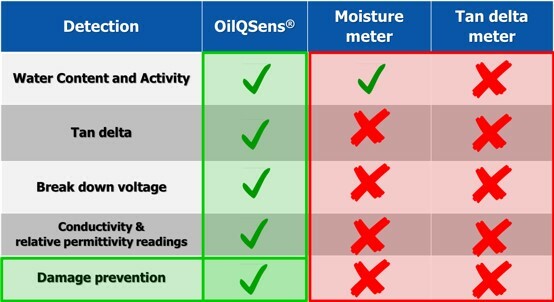 There is no other single system available that can provide the range of monitoring available from OilQSense. It stands alone and unchallenged in being able to provide real time, online, condition monitoring.